When Hennessey announced that its street-legal production Venom GT had set the world record as the quickest production vehicle earlier this year, everyone was amazed. The supercar was the first production car to accelerate from 0-300 km/h in just 13.63 seconds. The incredibly fast sprint time set a new world record as recorded by Guinness World Records on January 10. Was Hennessey Performance satisfied with that? John Hennessey, who takes fast cars and makes them even faster, wanted to see what kind of a top speed the 1,244 horsepower Venom GT would produce. Where is there a track long enough for the high-speed testing? The Hennessey team took the Venom GT to the United States Naval Air Station (NAS) Lemoore in Central California for the acceleration runs. NAS Lemoore was chosen for testing and is home to one of the longest paved runways in North America. Hennessey has just announced that on February 9, 2013 its street-legal Venom GT accelerated to 265.7 mph (427.6 km/h) during testing making the exotic ultra-supercar the fastest production vehicle available for public purchase on the planet. The top speed run was accomplished over a distance of two miles using a full-production Venom GT. Is the Venom GT really street legal? Hennessey’s Venom GT is a street-legal supercar that is powered by a 7.0-liter (427 cubic inch) V-8 engine fed by twin Precision turbochargers, and produces 1,244 horsepower and 1,155 lb-ft of neck-snapping torque. All testing was validated by (2) VBOX 3i GPS-based data logging systems and VBOX officials were on hand to certify the numbers. The seventh production Venom GT from Hennessey Performance ran on Michelin Pilot Super Sport DOT-approved radial tires, utilizes Brembo 4-wheel carbon ceramic disc brakes, and features a full interior (replete with high-end stereo, air conditioning, and leather seats). The incredible ultra-supercar weights in at just 1,244 kg (2,743 lbs) and the rear-wheel-drive Venom GT delivers a power-to-weight ratio of 1 horsepower per each kilogram of vehicle curb weight. The Venom GT gets the world’s fastest production car designation after beating out a Bugatti Veyron Super Sport. The Veyron SS attained a speed of 267.8 mph in July 2010, but the top speed was achieved using a state of tune that is not available to customers paying the $2.5 million dollar purchase price as a production Veyron SS is speed limited to 257.8 mph. Furthermore, the Veyron SS top speed testing was conducted over the 5.6 mile long straightaway that is part of Volkswagen Group AG's private test track located near Ehra-Lessien, Germany. "Afforded the same distance to accelerate, the Venom GT would exceed 275 mph," said John Hennessey. He went on to say, "While a Veyron Super Sport did run 267.8 mph, Bugatti speed-limits its production vehicles to 258 mph, thus, at 265.7 mph the Venom GT is the fastest production car available to the public." The Venom GT record run will be featured in the May 2013 issue of TopGear magazine as part of a story produced by TopGear US Editor, Pat Devereaux who was present to witness the top speed testing. Also on hand were Captain Eric "Snake" Venoma, Commanding Officer at NAS Lemoore who was watching over the nearly 200 battle-ready F/A-18 fighter jets. "While the 2.9 mile long runway is more than enough acceleration distance for a F/A-18 fighter jet, it was far too short for the Venom GT to reach it's true top speed," said Hennessey Performance CEO, Don Goldman. The Hennessey Venom GT is not only the quickest and fastest production car in the world, but it is also one of the most exclusive. Hennessey plans on building only 29 Venom GTs, with one-third of the production run already being sold. 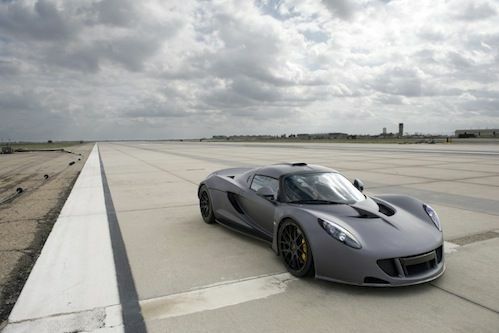 The Hennessey Venom GT has a purchase price of $1.2 million US plus shipping, not including options. Each vehicle is custom built to order and requires six months to build. Interested parties can contact John Hennessey at 949-206-1120 for more information. Watch the Venom GT Runs 265.7 mph: Now the Fastest Production Vehicle You Can Buy video.